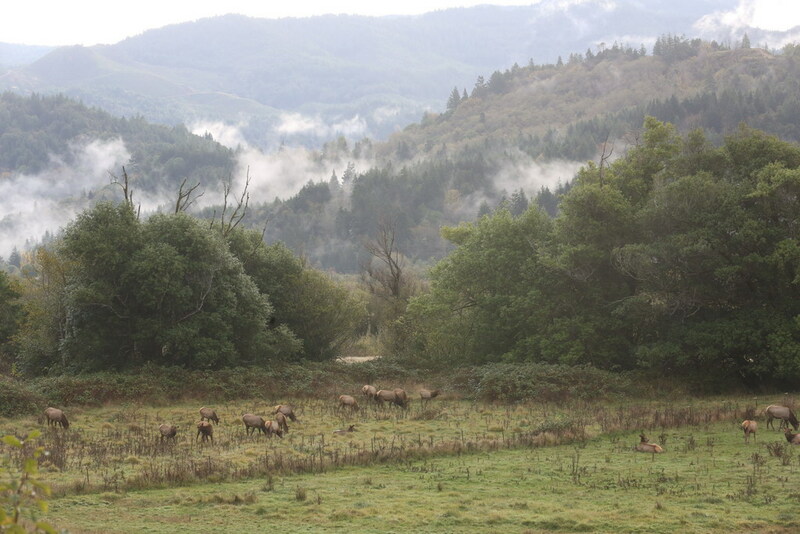 I’ve been following a herd of elk that hangs out on the Wedderburn side of the Rogue River, just over the Patterson Bridge from Gold Beach. There must be thirty or so in the herd including several bulls, all but one of which are still young. The young ones pose no threat to the lead bull. A few of the calves are probably males, too, but calves are calves, as far as I’m concerned. The big bull isn’t anything spectacular, or so I’ve been told by the locals. 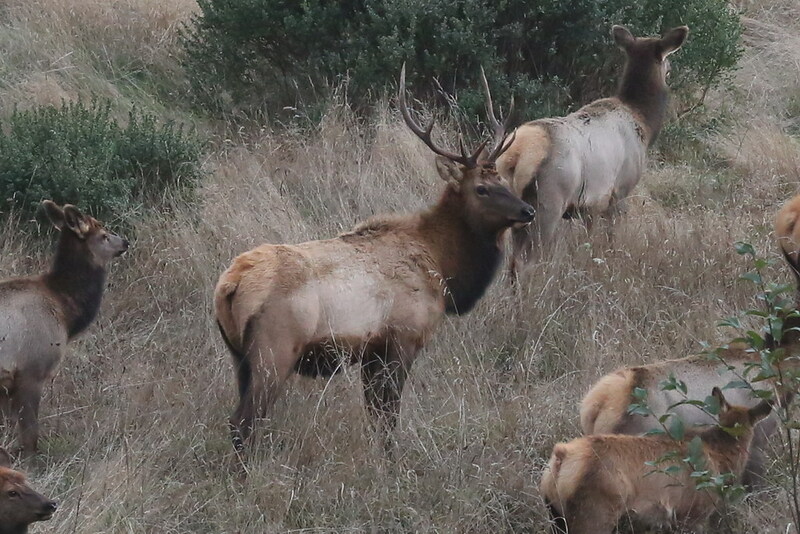 At least one fellow I spoke with said he thought a couple of bigger bulls might come out of the hills, this fall, and challenge the bull that currently “owns” the herd. 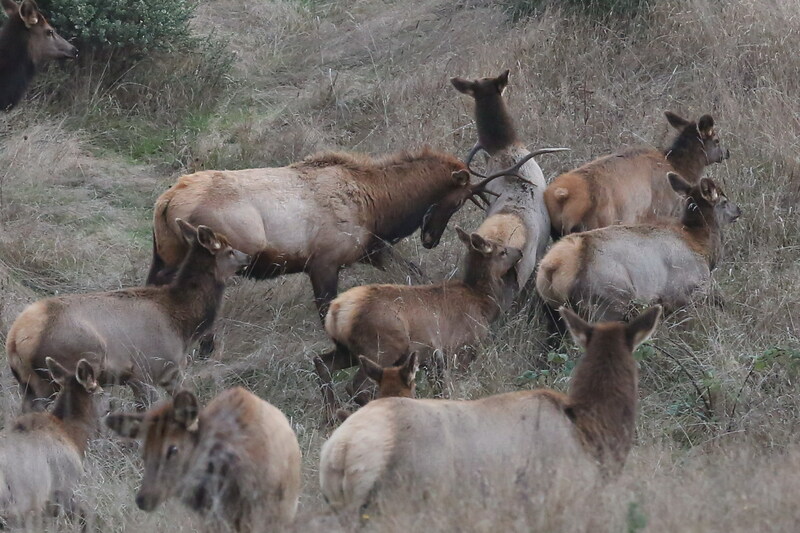 That would be a sight to see: Bulls squaring off in an epic battle over a harem. When I see elk, it’s always the big bulls, with their massive racks, or the really young calves, with their disproportionately big eyes, that I want to capture with my camera. The younger bulls and the cows hold no interest for me nor, it seems, much of anyone else. 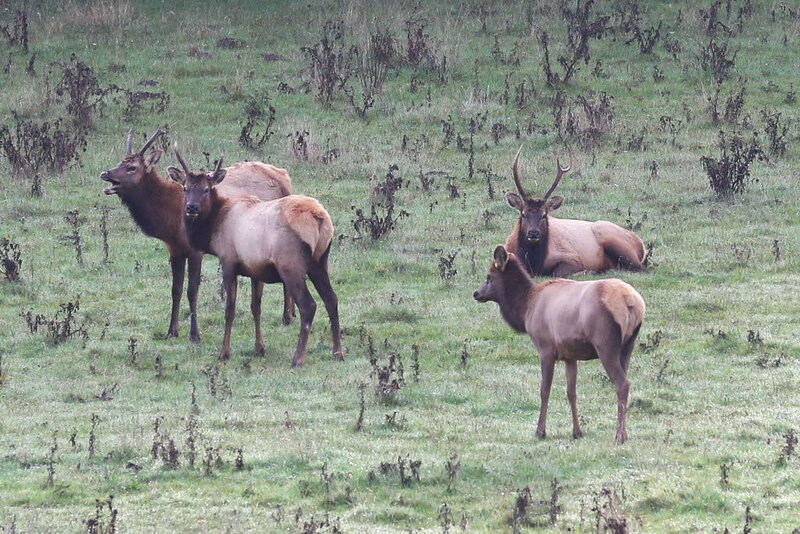 I’ve photographed this herd a couple of times in the last few days with my Canon 5D Mark III. 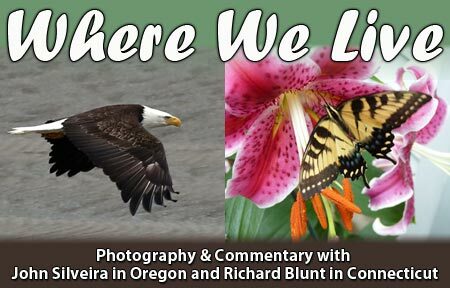 On one of the trips I almost missed them but my eagle-eyed friend, Christine Mack, pointed them out as I was driving by. So I was able to stop and get some interesting photos. Fortunately, I had my EF 70-200mm f/2.8L IS II USM lens attached to the camera, both times, so I didn’t have to waste time switching lenses. It’s currently my best lens and arguably the best zoom lens made by Canon or almost anyone else. I use it as my walk-around lens because with the full-frame sensor I can get decent fields of view and with the possible 2.8 f-stop, at all focal lengths, it’s good in a lot of low-light situations. On my previous camera, a Canon 60D, which has a cropped sensor, the EF 70-200mm f/2.8L IS II USM lens had too narrow a field of view to be used all the time. These are three of the young bulls that hang with the herd. None, this year, are a challenge to the bull that “owns” the herd. This is one of this year’s calves. 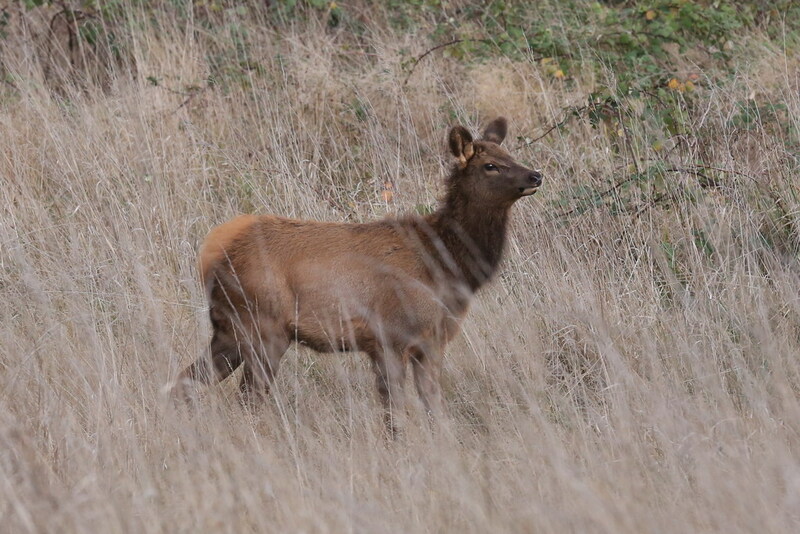 Not as cute as it was just a few months ago, the calves are a close second to a bull with a full rack of antlers when you consider what most people want to see when they see elk. 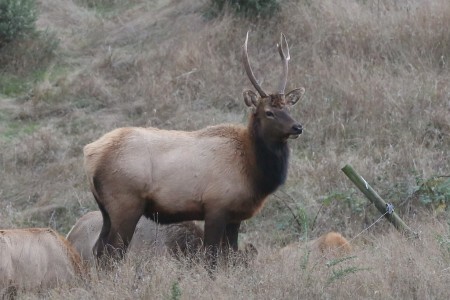 This is a better look at one of the young bulls. He doesn’t have much of a rack and it’s oddly unbalanced. 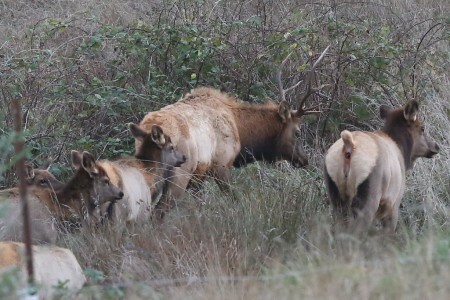 This guy with the big rack is the dominant bull in this herd. This doesn’t look very gentlemanly, but using his antlers this way seems to be how the dominant male gets the cows going when he either wants the herd to move or when they’re just in his way. In this case, I think he was just irritated with the cow being in his way. When I returned to the car, my friend, Christine, didn’t have any nice things to say about the bull. Here he is, in all his glory. But as imposing as he is, there are bigger bulls with bigger racks out there, and if one shows up, this fellow may lose his harem.